This morning we headed out to Stellwagen Bank in good conditions in hopes of finding the humpback whales which have been seen over the past two days. 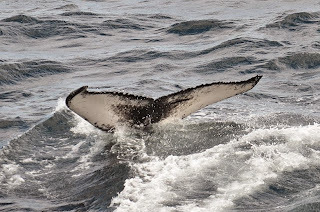 Different whales have been seen over the past three days which is a great sign that many whales are back in the area ready to fatten up over the next couple of months. We travelled all the way across the northwest corner before spotting some blows and activity out ahead of us. 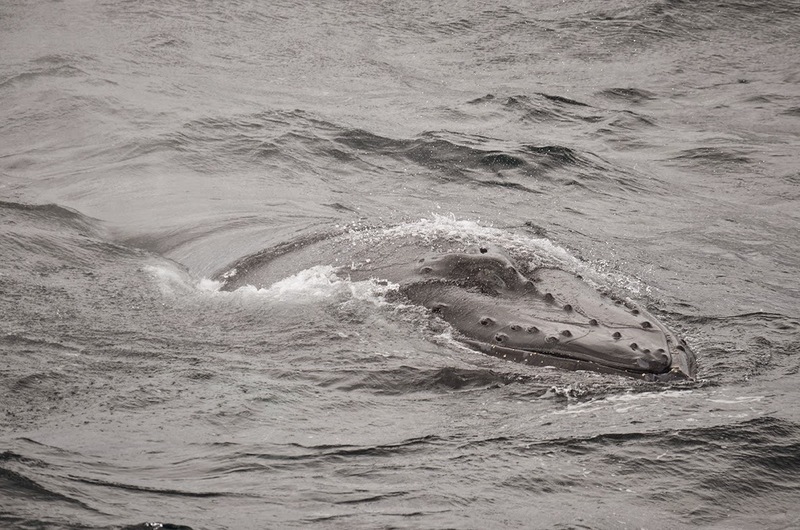 At first this whale was very difficult to spot, it would come up for a breath or two and then disappear from view. 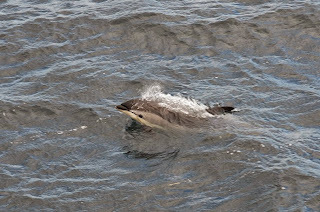 Finally our captain got us in the right position and we got excellent close up views of not one, but two humpback whales and along the way, a group of 30-50 Atlantic white sided dolphin amused us with their antics! Though all our passengers wanted to know which whales we had seen, our identification efforts have so far come up empty handed. 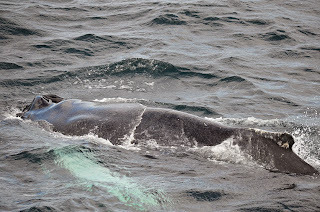 Only one whale actually raised its fluke but the other has some distinctive white marking on its dorsal fin which may provide enough to identify it with. Both these whales seemed smaller than full grown adult size so may be juveniles returning the feeding ground for one of their first feeding seasons. One of the whales seemed particularly thin and spent a lot of time swimming just below the surface in between breaths. 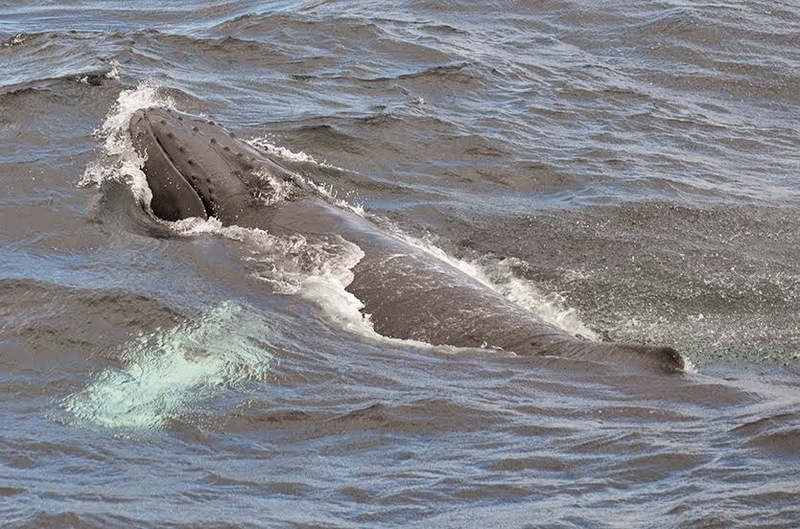 A whale’s thick blubber layer isn’t only for keeping warm, it is also a buoyancy aid and if a whale loses too much, it can have trouble staying at the surface. This thinness may be a problem and we’ll want to keep an eye on this whale through the season to make sure that it is improving but many of our whales are returning from their breeding grounds in the Caribbean and haven’t eaten in months, they’re sure to look pretty thin! 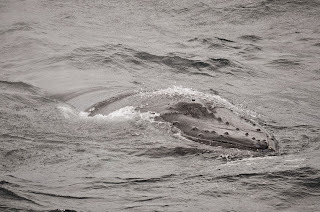 The second whale was a showstopper and displayed quite a lot of curiosity towards the boat with some underwater rolling and swimming below our pulpits! 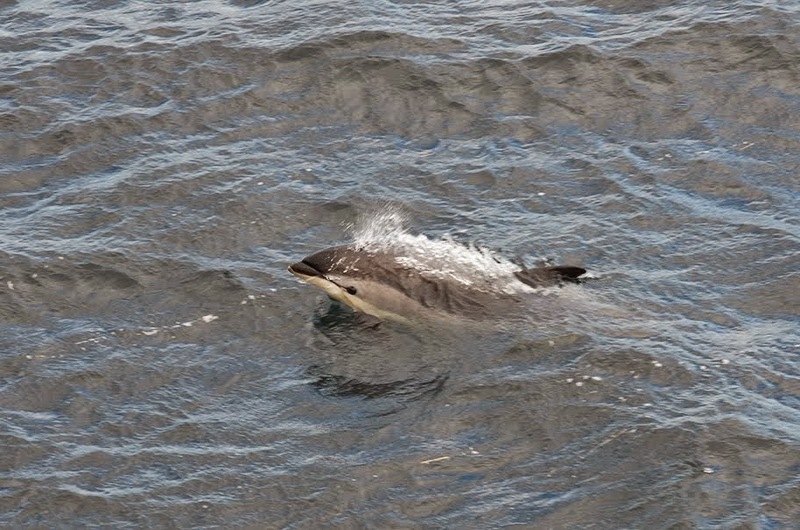 It was an absolutely stellar day out on Stellwagen Bank.